There is little doubt that technology will continue to drive change across the developing world. However, uncertainty exists about the role of technological advances in alleviating poverty. To uncover the range of possibilities that may emerge, novel approaches like scenario planning are essential. “Scenarios for the Future of Technology and International Development,” a new report, features four very different - yet very plausible - visions of how technology could profoundly alter how we address some of the most pressing challenges in the developing world. Scenario planning - an innovative method of creating narratives about the future - is a powerful tool for assisting organizations in considering how complex problems could evolve and be solved over the long term. The scenario planning process helps to identify unique opportunities, rehearse important decisions by simulating their broader implications, and illuminate previously unexplored areas of intersection. The Rockefeller Foundation supports work that expands opportunity and strengthens resilience to social, economic, health, and environmental challenges - affirming its pioneering philanthropic mission, since 1913, to “promote the well-being” of humanity. We take a synergistic, strategic approach that places a high value on innovative processes and encourages new ways of seeking ideas, to break down silos and encourage interdisciplinary thinking. One important - and novel - component of our strategy toolkit is scenario planning, a process of creating narratives about the future based on factors likely to affect a particular set of challenges and opportunities. We believe that scenario planning has great potential for use in philanthropy to identify unique interventions, simulate and rehearse important decisions that could have profound implications, and highlight previously undiscovered areas of connection and intersection. Most important, by providing a methodological structure that helps us focus on what we don’t know - instead of what we already know - scenario planning allows us to achieve impact more effectively. The results of our first scenario planning exercise demonstrate a provocative and engaging exploration of the role of technology and the future of globalization, as you will see in the following pages. This report is crucial reading for anyone interested in creatively considering the multiple, divergent ways in which our world could evolve. The sparks of insight inspiring these narratives - along with their implications for philanthropy as a whole - were generated through the invaluable collaboration of grantee representatives, external experts, and Rockefeller Foundation staff. I offer a special thanks to Peter Schwartz, Andrew Blau, and the entire team at Global Business Network, who have helped guide us through this stimulating and energizing process. Leading this effort at the Rockefeller Foundation is our Research Unit, which analyzes emerging risks and opportunities and thinks imaginatively about how to respond to the complex, rapidly changing world around us. This outward-looking intelligence function adopts a cross-cutting mindset that synthesizes and integrates knowledge that accelerates our ability to act more quickly and effectively. It has also helped to shape and build the notion of “pro-poor foresight” that is committed to applying forward-looking tools and techniques to improve the lives of poor and vulnerable populations around the world. I hope this publication makes clear exactly why my colleagues and I are so excited about the promise of using scenario planning to develop robust strategies and offer a refreshing viewpoint on the possibilities that lie ahead. We are at a moment in history that is full of opportunity. Technology is poised to transform the lives of millions of people throughout the world, especially those who have had little or no access to the tools that can deliver sustainable improvements for their families and communities. From farmers using mobile phones to buy and sell crops to doctors remotely monitoring and treating influenza outbreaks in rural villages, technology is rapidly becoming more and more integral to the pace and progress of development. Philanthropy has a unique and critical role to play in this process. By focusing its patience, capital, and attention on the links between technology and international development, philanthropy will change not just lives but the very context in which the field of philanthropy operates. This report represents an initial step in that direction. It explores four very different - yet very possible - scenarios for the future of technology and development in order to illuminate the challenges and opportunities that may lie ahead. It promotes a deeper understanding of the complex forces and dynamics that will accelerate or inhibit the use of technology to spur growth, opportunity, and resilience especially in the developing world. Finally, it will seed a new strategic conversation among the key public, private, and philanthropic stakeholders about technology and development at the policy, program, and human levels. The Rockefeller Foundation’s use of scenario planning to explore technology and international development has been both inspired and ambitious. Throughout my 40-plus-year career as a scenario planner, I have worked with many of the world’s leading companies, governments, foundations, and nonprofits - and I know firsthand the power of the approach. Scenario planning is a powerful tool precisely because the future is unpredictable and shaped by many interacting variables. Scenarios enable us to think creatively and rigorously about the different ways these forces may interact, while forcing us to challenge our own assumptions about what we believe or hope the future will be. Scenarios embrace and weave together multiple perspectives and provide an ongoing framework for spotting and making sense of important changes as they emerge. Perhaps most importantly, scenarios give us a new, shared language that deepens our conversations about the future and how we can help to shape it. The Rockefeller Foundation has already used this project as an opportunity to clarify and advance the relationship between technology and development. Through interviews and the scenario workshops, they have engaged a diverse set of people - from different geographies, disciplines, and sectors - to identify the key forces driving change, to explore the most critical uncertainties, and to develop challenging yet plausible scenarios and implications. They have stretched their thinking far beyond theoretical models of technology innovation and diffusion in order to imagine how technology could actually change the lives of people from many walks of life. This is only the start of an important conversation that will continue to shape the potential of technology and international development going forward. I look forward to staying a part of that conversation and to the better future it will bring. For decades, technology has been dramatically changing not just the lives of individuals in developed countries, but increasingly the lives and livelihoods of people throughout the developing world. Whether it is a community mobile phone, a solar panel, a new farming practice, or a cutting-edge medical device, technology is altering the landscape of possibility in places where possibilities used to be scarce. And yet looking out to the future, there is no single story to be told about how technology will continue to help shape - or even revolutionize - life in developing countries. There are many possibilities, some good and some less so, some known and some unknowable. Indeed, for everything we think we can anticipate about how technology and international development will interact and intertwine in the next 20 years and beyond, there is so much more that we cannot yet even imagine. For philanthropies as well as for other organizations, this presents a unique challenge: given the uncertainty about how the future will play out, how can we best position ourselves not just to identify technologies that improve the lives of poor communities but also to help scale and spread those that emerge? And how will the social, technological, economic, environmental, and political conditions of the future enable or inhibit our ability to do so? The Rockefeller Foundation believes that in order to understand the many ways in which technology will impact international development in the future, we must first broaden and deepen our individual and collective understanding of the range of possibilities. This report, and the project upon which it is based, is one attempt to do that. In it, we share the outputs and insights from a year-long project, undertaken by the Rockefeller Foundation and Global Business Network (GBN), designed to explore the role of technology in international development through scenario planning, a methodology in which GBN is a long-time leader. Accelerating and Enhancing Pro-Poor Development Opportunities, with support from the Rockefeller Foundation. That effort was a reflection of the Foundation’s strong commitment to exploring innovative processes and embracing new pathways for insight aimed at helping the world’s poor. With this report, the Foundation takes a further step in advancing the field of pro-poor foresight, this time through the lens of scenario planning. The goal of this project was not to affirm what is already known and knowable about what is happening right now at the intersections of technology and development. Rather, it was to explore the many ways in which technology and development could co-evolve - could both push and inhibit each other - in the future, and then to begin to examine what those possible alternative paths may imply for the world’s poor and vulnerable populations. Such an exercise required project participants to push their thinking far beyond the status quo, into uncharted territory. Scenario planning is a methodology designed to help guide groups and individuals through exactly this creative process. The process begins by identifying forces of change in the world, then combining those forces in different ways to create a set of diverse stories - or scenarios - about how the future could evolve. Scenarios are designed to stretch our thinking about both the opportunities and obstacles that the future might hold; they explore, through narrative, events and dynamics that might alter, inhibit, or enhance current trends, often in surprising ways. Together, a set of scenarios captures a range of future possibilities, good and bad, expected and surprising - but always plausible. Importantly, scenarios are not predictions. Rather, they are thoughtful hypotheses that allow us to imagine, and then to rehearse, different strategies for how to be more prepared for the future - or more ambitiously, how to help shape better futures ourselves. Technology was chosen as a focal point of this project because of its potentially transformative role - both in a positive and negative way - in addressing a wide range of development challenges, from climate change, healthcare, and agriculture to housing, transportation, and education. Yet while there is little doubt that technology will continue to be a driver of change across the developing world in the future, the precise trajectory along which technological innovation will travel is highly uncertain. For example, will critical technological advances come from the developed world, or will innovators and their innovations be more geographically dispersed? Or, how might the global economic and political environment affect the pace of technology development? It is important to state that in focusing on technology, this project did not set out to identify a set of exact, yet-to-be-invented technologies that will help shape and change the future. Rather, the goal was to gain a broader and richer understanding of different paths along which technology could develop - paths that will be strongly influenced by the overall global environment in which the inventors and adopters of those technologies will find themselves working and dwelling. Technology, as a category, cannot be divorced from the context in which it develops. The scenarios shared in this report explore four such contexts, each of which, as you’ll see, suggests very different landscapes for technology and its potential impacts in the developing world. Finally, a note about what we mean by “technology.” In this report, we use the term to refer to a broad spectrum of tools and methods of organization. Technologies can range from tools for basic survival, such as a treadle pump and basic filtration technologies, to more advanced innovations, such as methods of collecting and utilizing data in health informatics and novel building materials with real-time environmental sensing capabilities. This report focuses on themes associated with the widespread scalability, adoption, and assessment of technology in the developing world. While the scenarios themselves are narratives about the global environment, we have paid particular attention to how events might transpire in sub-Saharan Africa, Southeast Asia, and India. Every scenario project has a focal question - a broad yet strategic query that serves as an anchor for the scenarios. How might technology affect barriers to building resilience and equitable growth in the developing world over the next 15 to 20 years? In other words, what new or existing technologies could be leveraged to improve the capacity of individuals, communities, and systems to respond to major changes, or what technologies could improve the lives of vulnerable populations around the world? A 15- to 20-year timeframe was chosen on the assumption that it is both sufficiently long enough that significant technological change is plausible and sufficiently short enough that we can imagine some possibilities for the kinds of technologies that could be developed and applied. Focusing on how to overcome a set of obstacles associated with the application of technology to the challenges of development helped to both bound the inquiry and promote a problem-solving approach that seeks to identify potential, systematic intervention opportunities. The Foundation’s work promotes “resilience and equitable growth.” Resilience refers to the capacity of individuals, communities, and systems to survive, adapt, and grow in the face of changes, even catastrophic incidents. Equitable growth involves enabling individuals, communities, and institutions to access new tools, practices, resources, services, and products. It is our hope that these scenarios help inspire the same future-orientation in other initiatives that are broadly concerned with technology and international development. Of course, there is no hard data about the future - nobody yet knows precisely what technologies will be successful at addressing new and evolving development needs. Rather, as you read the scenarios, think of them as a journey - four journeys - into a future that is relevant, thought-provoking, and possible. Imagine how the world will function and how it will be organized to tackle the challenges it faces. Who will be responsible for driving local and global development initiatives and what would that require? And what is your own role in leading your organization, community, or region to a preferred future? Scenarios are a medium through which great change can be not just envisioned but also actualized. The more closely you read them, the more likely it becomes that you will recognize their important but less obvious implications to you, your work, and your community. We strongly encourage you to share and discuss this report widely, use it as a springboard for further creative thinking about how technology could shape development, and test and adjust your strategies or personal actions accordingly. It is also our hope that these scenarios help to identify potential areas of future work for governments, philanthropies, corporations, and nonprofits, and that they illuminate choices and commitments that a wide range of organizations may want to make in these areas in the future. This report adds to a growing body of literature focusing on the relationship between technology, development, and social systems. While not a comprehensive list, the following readings offer additional insights on this topic. Caroline Wagner - The New Invisible College: Science for Development, 2008. Institute for the Future - Science and Technology Outlook: 2005-2055, 2006. RAND Corporation - The Global Technology Revolution 2020, In-Depth Analyses, 2006. 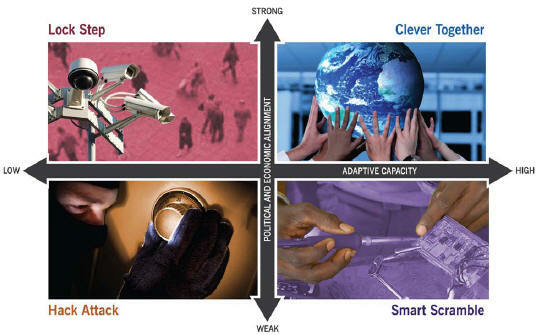 World Bank - Science, Technology, and Innovation: Capacity Building for Sustainable Growth and Poverty Reduction, 2008. UN Millennium Project - Task Force on Science, Technology, and Innovation, Innovation: Applying Knowledge in Development, 2006. W. Brian Arthur - The Nature of Technology: What It Is and How It Evolves, 2009. 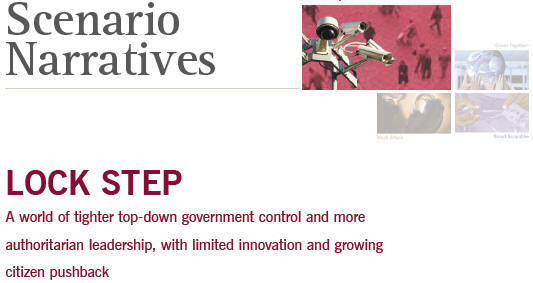 STEPS Centre Working Papers - Innovation, Sustainability, Development: A New Manifesto, 2009. The Rockefeller Foundation and GBN began the scenario process by surfacing a host of driving forces that would affect the future of technology and international development. These forces were generated through both secondary research and in-depth interviews with Foundation staff, Foundation grantees, and external experts. Next, all these constituents came together in several exploratory workshops to further brainstorm the content of these forces, which could be divided into two categories: predetermined elements and critical uncertainties. For example, it is a near geopolitical certainty that - with the rise of China, India, and other nations - a multi-polar global system is emerging. One demographic certainty is that global population growth will continue and will put pressure on energy, food, and water resources - especially in the developing world. Another related certainty: that the world will strive to source more of its energy from renewable resources and may succeed, but there will likely still be a significant level of global interdependence on energy. Predetermined elements are important to any scenario story, but they are not the foundation on which these stories are built. Rather, scenarios are formed around “critical uncertainties” - driving forces that are considered both highly important to the focal issue and highly uncertain in terms of their future resolution. Whereas predetermined elements are predictable driving forces, uncertainties are by their nature unpredictable: their outcome can be guessed at but not known. While any single uncertainty could challenge our thinking, the future will be shaped by multiple forces playing out over time. The scenario framework provides a structured way to consider how these critical uncertainties might unfold and evolve in combination. Identifying the two most important uncertainties guarantees that the resulting scenarios will differ in ways that have been judged to be critical to the focal question. During this project’s scenario creation workshop, participants - who represented a range of regional and international perspectives - selected the two critical uncertainties that would form the basis of the scenario framework. They chose these two uncertainties from a longer list of potential uncertainties that might shape the broader contextual environment of the scenarios, including social, technology, economic, environmental, and political trends. the locus of innovation for crucial technologies for development. The two chosen uncertainties, introduced below, together define a set of four scenarios for the future of technology and international development that are divergent, challenging, internally consistent, and plausible. Each of the two uncertainties is expressed as an axis that represents a continuum of possibilities ranging between two endpoints. This uncertainty refers to both the amount of economic integration - the flow of goods, capital, people, and ideas - as well as the extent to which enduring and effective political structures enable the world to deal with many of the global challenges it faces. On one end of the axis, we would see a more integrated global economy with high trade volumes, which enables access to a wider range of goods and services through imports and exports, and the increasing specialization of exports. We would also see more cooperation at the supra-national level, fostering increased collaboration, strengthened global institutions, and the formation of effective international problem-solving networks. At the other axis endpoint, the potential for economic development in the developing world would be reduced by the fragility of the overall global economy - coupled with protectionism and fragmentation of trade - along with a weakening of governance regimes that raise barriers to cooperation, thereby hindering agreement on and implementation of large-scale, interconnected solutions to pressing global challenges. This uncertainty refers to the capacity at different levels of society to cope with change and to adapt effectively. This ability to adapt can mean proactively managing existing systems and structures to ensure their resilience against external forces, as well as the ability to transform those systems and structures when a changed context means they are no longer suitable. Adaptive capacity is generally associated with higher levels of education in a society, as well as the availability of outlets for those who have educations to further their individual and societal well-being. the free flow of communication and ideas, especially between and across different levels, e.g., bottom-up and top-down. Lower levels of adaptive capacity emerge in the absence of these characteristics and leave populations particularly vulnerable to the disruptive effects of unanticipated shocks. The scenarios that follow are not meant to be exhaustive - rather, they are designed to be both plausible and provocative, to engage your imagination while also raising new questions for you about what that future might look and feel like. Each scenario tells a story of how the world, and in particular the developing world, might progress over the next 15 to 20 years, with an emphasis on those elements relating to the use of different technologies and the interaction of these technologies with the lives of the poor and vulnerable. Accompanying each scenario is a range of elements that aspire to further illuminate life, technology, and philanthropy in that world. Please keep in mind that the scenarios in this report are stories, not forecasts, and the plausibility of a scenario does not hinge on the occurrence of any particular detail. In the scenario titled “Clever Together,” for example, “a consortium of nations, NGOs [non-governmental organizations], and companies establish the Global Technology Assessment Office” - a detail meant to symbolize how a high degree of international coordination and adaptation might lead to the formation of a body that anticipates technology’s potential societal implications. That detail, along with dozens of others in each scenario, is there to give you a more tangible “feel” for the world described in the scenario. Please consider names, dates, and other such specifics in each scenario as proxies for types of events, not as necessary conditions for any particular scenario to unfold. We now invite you to immerse yourself in each future world and consider four different visions for the evolution of technology and international development to 2030. In 2012, the pandemic that the world had been anticipating for years finally hit. Unlike 2009’s H1N1, this new influenza strain - originating from wild geese - was extremely virulent and deadly. Even the most pandemic-prepared nations were quickly overwhelmed when the virus streaked around the world, infecting nearly 20 percent of the global population and killing 8 million in just seven months, the majority of them healthy young adults. The pandemic also had a deadly effect on economies: international mobility of both people and goods screeched to a halt, debilitating industries like tourism and breaking global supply chains. Even locally, normally bustling shops and office buildings sat empty for months, devoid of both employees and customers. The pandemic blanketed the planet - though disproportionate numbers died in Africa, Southeast Asia, and Central America, where the virus spread like wildfire in the absence of official containment protocols. But even in developed countries, containment was a challenge. The United States' initial policy of “strongly discouraging” citizens from flying proved deadly in its leniency, accelerating the spread of the virus not just within the U.S. but across borders. However, a few countries did fare better - China in particular. The Chinese government’s quick imposition and enforcement of mandatory quarantine for all citizens, as well as its instant and near-hermetic sealing off of all borders, saved millions of lives, stopping the spread of the virus far earlier than in other countries and enabling a swifter post- pandemic recovery. China’s government was not the only one that took extreme measures to protect its citizens from risk and exposure. During the pandemic, national leaders around the world flexed their authority and imposed airtight rules and restrictions, from the mandatory wearing of face masks to body-temperature checks at the entries to communal spaces like train stations and supermarkets. Even after the pandemic faded, this more authoritarian control and oversight of citizens and their activities stuck and even intensified. In order to protect themselves from the spread of increasingly global problems - from pandemics and transnational terrorism to environmental crises and rising poverty - leaders around the world took a firmer grip on power. At first, the notion of a more controlled world gained wide acceptance and approval. Citizens willingly gave up some of their sovereignty - and their privacy - to more paternalistic states in exchange for greater safety and stability. Citizens were more tolerant, and even eager, for top-down direction and oversight, and national leaders had more latitude to impose order in the ways they saw fit. biometric IDs for all citizens, for example, and tighter regulation of key industries whose stability was deemed vital to national interests. In many developed countries, enforced cooperation with a suite of new regulations and agreements slowly but steadily restored both order and, importantly, economic growth. Across the developing world, however, the story was different - and much more variable. Top-down authority took different forms in different countries, hinging largely on the capacity, caliber, and intentions of their leaders. In countries with strong and thoughtful leaders, citizens’ overall economic status and quality of life increased. In India, for example, air quality drastically improved after 2016, when the government outlawed high-emitting vehicles. In Ghana, the introduction of ambitious government programs to improve basic infrastructure and ensure the availability of clean water for all her people led to a sharp decline in water-borne diseases. But more authoritarian leadership worked less well - and in some cases tragically - in countries run by irresponsible elites who used their increased power to pursue their own interests at the expense of their citizens. There were other downsides, as the rise of virulent nationalism created new hazards: spectators at the 2018 World Cup, for example, wore bulletproof vests that sported a patch of their national flag. Strong technology regulations stifled innovation, kept costs high, and curbed adoption. the locus of technology innovation was largely in the developed world, leaving many developing countries on the receiving end of technologies that others consider “best” for them. Some governments found this patronizing and refused to distribute computers and other technologies that they scoffed at as “second hand.” Meanwhile, developing countries with more resources and better capacity began to innovate internally to fill these gaps on their own. Meanwhile, in the developed world, the presence of so many top-down rules and norms greatly inhibited entrepreneurial activity. Scientists and innovators were often told by governments what research lines to pursue and were guided mostly toward projects that would make money (e.g., market-driven product development) or were “sure bets” (e.g., fundamental research), leaving more risky or innovative research areas largely untapped. Well-off countries and monopolistic companies with big research and development budgets still made significant advances, but the IP behind their breakthroughs remained locked behind strict national or corporate protection. Russia and India imposed stringent domestic standards for supervising and certifying encryption-related products and their suppliers - a category that in reality meant all IT innovations. The U.S. and EU struck back with retaliatory national standards, throwing a wrench in the development and diffusion of technology globally. Especially in the developing world, acting in one’s national self-interest often meant seeking practical alliances that fit with those interests - whether it was gaining access to needed resources or banding together in order to achieve economic growth. In South America and Africa, regional and sub-regional alliances became more structured. Kenya doubled its trade with southern and eastern Africa, as new partnerships grew within the continent. China’s investment in Africa expanded as the bargain of new jobs and infrastructure in exchange for access to key minerals or food exports proved agreeable to many governments. Cross-border ties proliferated in the form of official security aid. While the deployment of foreign security teams was welcomed in some of the most dire failed states, one-size-fits-all solutions yielded few positive results. By 2025, people seemed to be growing weary of so much top-down control and letting leaders and authorities make choices for them. Wherever national interests clashed with individual interests, there was conflict. Sporadic pushback became increasingly organized and coordinated, as disaffected youth and people who had seen their status and opportunities slip away - largely in developing countries - incited civil unrest. In 2026, protestors in Nigeria brought down the government, fed up with the entrenched cronyism and corruption. Even those who liked the greater stability and predictability of this world began to grow uncomfortable and constrained by so many tight rules and by the strictness of national boundaries. The feeling lingered that sooner or later, something would inevitably upset the neat order that the world’s governments had worked so hard to establish. Philanthropic organizations will face hard choices in this world. Given the strong role of governments, doing philanthropy will require heightened diplomacy skills and the ability to operate effectively in extremely divergent environments. Philanthropy grantee and civil society relationships will be strongly moderated by government, and some foundations might choose to align themselves more closely with national official development assistance (ODA) strategies and government objectives. Larger philanthropies will retain an outsized share of influence, and many smaller philanthropies may find value in merging financial, human, and operational resources. Philanthropic organizations interested in promoting universal rights and freedoms will get blocked at many nations’ borders. Developing smart, flexible, and wide-ranging relationships in this world will be key; some philanthropies may choose to work only in places where their skills and services don’t meet resistance. Many governments will place severe restrictions on the program areas and geographies that international philanthropies can work in, leading to a narrower and stronger geographic focus or grant-making in their home country only. While there is no way of accurately predicting what the important technological advancements will be in the future, the scenario narratives point to areas where conditions may enable or accelerate the development of certain kinds of technologies. Thus for each scenario we offer a sense of the context for technological innovation, taking into consideration the pace, geography, and key creators. We also suggest a few technology trends and applications that could flourish in each scenario. Technological innovation in “Lock Step” is largely driven by government and is focused on issues of national security and health and safety. Most technological improvements are created by and for developed countries, shaped by governments’ dual desire to control and to monitor their citizens. In states with poor governance, large-scale projects that fail to progress abound. In the aftermath of pandemic scares, smarter packaging for food and beverages is applied first by big companies and producers in a business-to-business environment, and then adopted for individual products and consumers. New diagnostics are developed to detect communicable diseases. The application of health screening also changes; screening becomes a prerequisite for release from a hospital or prison, successfully slowing the spread of many diseases. Tele-presence technologies respond to the demand for less expensive, lower-bandwidth, sophisticated communications systems for populations whose travel is restricted. Driven by protectionism and national security concerns, nations create their own independent, regionally defined IT networks, mimicking China’s firewalls. Governments have varying degrees of success in policing Internet traffic, but these efforts nevertheless fracture the “World Wide” Web. Manisha gazed out on the Ganges River, mesmerized by what she saw. Back in 2010, when she was 12 years old, her parents had brought her to this river so that she could bathe in its holy waters. But standing at the edge, Manisha had been afraid. It wasn’t the depth of the river or its currents that had scared her, but the water itself: it was murky and brown and smelled pungently of trash and dead things. Manisha had balked, but her mother had pushed her forward, shouting that this river flowed from the lotus feet of Vishnu and she should be honored to enter it. Along with millions of Hindus, her mother believed the Ganges’s water could cleanse a person’s soul of all sins and even cure the sick. So Manisha had grudgingly dunked herself in the river, accidentally swallowing water in the process and receiving a bad case of giardia, and months of diarrhea, as a result. Remembering that experience is what made today so remarkable. It was now 2025. Manisha was 27 years old and a manager for the Indian government’s Ganges Purification Initiative (GPI). Until recently, the Ganges was still one of the most polluted rivers in the world, its coliform bacteria levels astronomical due to the frequent disposal of human and animal corpses and of sewage (back in 2010, 89 million liters per day) directly into the river. Dozens of organized attempts to clean the Ganges over the years had failed. In 2009, the World Bank even loaned India $1 billion to support the government’s multi-billion dollar cleanup initiative. But then the pandemic hit, and that funding dried up. But what didn’t dry up was the government’s commitment to cleaning the Ganges - now not just an issue of public health but increasingly one of national pride. Manisha had joined the GPI in 2020, in part because she was so impressed by the government’s strong stance on restoring the ecological health of India’s most treasured resource. Many lives in her home city of Jaipur had been saved by the government’s quarantines during the pandemic, and that experience, thought Manisha, had given the government the confidence to be so strict about river usage now: how else could they get millions of Indian citizens to completely shift their cultural practices in relationship to a holy site? Discarding ritually burned bodies in the Ganges was now illegal, punishable by years of jail time. Companies found to be dumping waste of any kind in the river were immediately shut down by the government. There were also severe restrictions on where people could bathe and where they could wash clothing. Every 20 meters along the river was marked by a sign outlining the repercussions of “disrespecting India’s most treasured natural resource.” Of course, not everyone liked it; protests flared every so often. But no one could deny that the Ganges was looking more beautiful and healthier than ever. Manisha watched as an engineering team began unloading equipment on the banks. Many top Indian scientists and engineers had been recruited by the government to develop tools and strategies for cleaning the Ganges in more high-tech ways. Her favorite were the submersible bots that continuously “swam” the river to detect, through sensors, the presence of chemical pathogens. New riverside filtration systems that sucked in dirty river water and spit out far cleaner water were also impressive - especially because on the outside they were designed to look like mini-temples. In fact, that’s why Manisha was at the river today, to oversee the installation of a filtration system located not even 100 feet from where she first stepped into the Ganges as a girl. The water looked so much cleaner now, and recent tests suggested that it might even meet drinkability standards by 2035. Manisha was tempted to kick off her shoe and dip her toe in, but this was a restricted area now - and she, of all people, would never break that law. The recession of 2008-10 did not turn into the decades-long global economic slide that many had feared. In fact, quite the opposite: strong global growth returned in force, with the world headed once again toward the demographic and economic projections forecasted before the downturn. India and China were on track to see their middle classes explode to 1 billion by 2020. Mega-cities like Sao Paulo and Jakarta expanded at a blistering pace as millions poured in from rural areas. Countries raced to industrialize by whatever means necessary; the global marketplace bustled. But two big problems loomed. First, not all people and places benefited equally from this return to globalized growth: all boats were rising, but some were clearly rising more. Second, those hell-bent on development and expansion largely ignored the very real environmental consequences of their unrestricted growth. Undeniably, the planet’s climate was becoming increasingly unstable. Sea levels were rising fast, even as countries continued to build-out coastal mega-cities. In 2014, the Hudson River overflowed into New York City during a storm surge, turning the World Trade Center site into a three-foot-deep lake. The image of motorboats navigating through lower Manhattan jarred the world’s most powerful nations into realizing that climate change was not just a developing-world problem. That same year, new measurements showing that atmospheric carbon dioxide levels were climbing precipitously created new urgency and pressure for governments (really, for everyone) to do something fast. In such an interconnected world, where the behaviors of one country, company, or individual had potentially high-impact effects on all others, piecemeal attempts by one nation here, one small collective of environmental organizations there, would not be enough to stave off a climate disaster - or, for that matter, to effectively address a host of other planetary-scale problems. 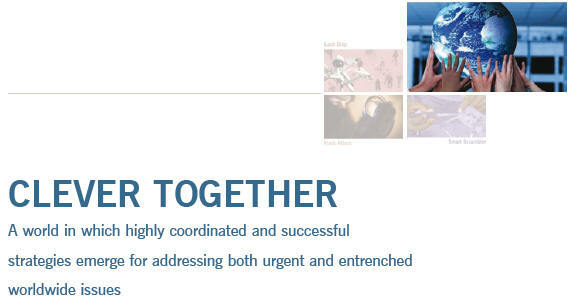 But highly coordinated worldwide strategies for addressing such urgent issues just might. What was needed was systems thinking - and systems acting - on a global scale. International coordination started slowly, then accelerated faster than anyone had imagined. In 2015, a critical mass of middle income and developed countries with strong economic growth publicly committed to leveraging their resources against global-scale problems, beginning with climate change. Together, their governments hashed out plans for monitoring and reducing greenhouse gas emissions in the short term and improving the absorptive capacity of the natural environment over the long term. In 2017, an international agreement was reached on carbon sequestration (by then, most multinational corporations had a chief carbon officer) and intellectual and financial resources were pooled to build out carbon capture processes that would best support the global ecosystem. A functioning global cap and trade system was also established. Worldwide, the pressure to reduce waste and increase efficiency in planet-friendly ways was enormous. New globally coordinated systems for monitoring energy use capacity - including smart grids and bottom-up pattern recognition technologies - were rolled out. These efforts produced real results: by 2022, new projections showed a significant slowing in the rise of atmospheric carbon levels. Inspired by the success of this experiment in collective global action, large-scale coordinated initiatives intensified. Centralized global oversight and governance structures sprang up, not just for energy use but also for disease and technology standards. Such systems and structures required far greater levels of transparency, which in turn required more tech-enabled data collection, processing, and feedback. Enormous, benign “sousveillance” systems allowed citizens to access data - all publicly available - in real time and react. Nation-states lost some of their power and importance as global architecture strengthened and regional governance structures emerged. International oversight entities like the UN took on new levels of authority, as did regional systems like the Association of Southeast Asian Nations (ASEAN), the New Partnership for Africa's Development (NEPAD), and the Asian Development Bank (ADB). The worldwide spirit of collaboration also fostered new alliances and alignments among corporations, NGOs, and communities. These strong alliances laid the groundwork for more global and participatory attempts to solve big problems and raise the standard of living of everyone. Coordinated efforts to tackle long-entrenched problems like hunger, disease, and access to basic needs took hold. New inexpensive technologies like better medical diagnostics and more effective vaccines improved healthcare delivery and health outcomes. Companies, NGOs, and governments - often acting together - launched pilot programs and learning labs to figure out how to best meet the needs of particular communities, increasing the knowledge base of what worked and what didn’t. Pharmaceuticals giants released thousands of drug compounds shown to be effective against diseases like malaria into the public domain as part of an “open innovation” agenda; they also opened their archives of R&D on neglected diseases deemed not commercially viable, offering seed funding to scientists who wanted to carry the research forward. There was a push for major innovations in energy and water for the developing world, as those areas were thought to be the key to improving equity. Better food distribution was also high on the agenda, and more open markets and south-south trade helped make this a reality. In 2022, a consortium of nations, NGOs, and companies established the Global Technology Assessment Office, providing easily accessible, real-time information about the costs and benefits of various technology applications to developing and developed countries alike. All of these efforts translated into real progress on real problems, opening up new opportunities to address the needs of the bottom billion - and enabling developing countries to become engines of growth in their own right. In many parts of the developing world, economic growth rates increased due to a host of factors. Improved infrastructure accelerated the greater mobility of both people and goods, and urban and rural areas got better connected. In Africa, growth that started on the coasts spread inward along new transportation corridors. Increased trade drove the specialization of individual firms and the overall diversification of economies. In many places, traditional social barriers to overcoming poverty grew less relevant as more people gained access to a spectrum of useful technologies - from disposable computers to do-it-yourself (DIY) windmills. In Africa, there was a big push for solar energy, as the physical geography and low population density of much of the continent enabled the proliferation of solar farms. The Desertec initiative to create massive thermal electricity plants to supply both North Africa and, via undersea cable lines, Southern Europe was a huge success. By 2025, a majority of electricity in the Maghreb was coming from solar, with exports of that power earning valuable foreign currency. The switch to solar created new “sun” jobs, drastically cut CO2 emissions, and earned governments billions annually. India exploited its geography to create similar “solar valleys” while decentralized solar-powered drip irrigation systems became popular in sub-Saharan Africa. Reduced energy dependency enabled all of these countries and regions to better control and manage their own resources. In Africa, political architecture above the nation-state level, like the African Union, strengthened and contributed to a “good governance” drive. Regional integration through COMESA (the Common Market for Eastern and Southern Africa) and other institutions allowed member nations to better organize to meet their collective needs as consumers and increasingly as producers. Over the course of two decades, enormous strides were made to make the world less wasteful, more efficient, and more inclusive. But the world was far from perfect. There were still failed states and places with few resources. Moreover, such rapid progress had created new problems. Rising consumption standards unexpectedly ushered in a new set of pressures: the improved food distribution system, for example, generated a food production crisis due to greater demand. Indeed, demand for everything was growing exponentially. By 2028, despite ongoing efforts to guide “smart growth,” it was becoming clear that the world could not support such rapid growth forever. In this world, philanthropic organizations focus their attention on the needs of the bottom billion, collaborating with governments, businesses, and local NGOs to improve standards of living around the globe. Operationally, this is a “virtual model” world in which philanthropies use all of the tools at their disposal to reinforce and bolster their work. With partnerships and networks increasingly key, philanthropies work in a more virtual way, characterized by lots of wikis, blogs, workspaces, video conferences, and virtual convenings. Smaller philanthropies proliferate, with a growing number of major donors emerging from the developing world. Systems thinking and knowledge management prove to be critical skills, as philanthropic organizations seek to share and spread best practices, identify leapfrog opportunities, and better spot problems in failed or weak states. There are considerable flows of talent between the for-profit and nonprofit sectors, and the lines between these types of organizations become increasingly blurred. In “Clever Together,” strong global cooperation on a range of issues drives technological breakthroughs that combat disease, climate change, and energy shortages. Trade and foreign direct investment spread technologies in all directions and make products cheaper for people in the developing world, thereby widening access to a range of technologies. The atmosphere of cooperation and transparency allows states and regions to glean insights from massive datasets to vastly improve the management and allocation of financial and environmental resources. The cost of capturing data through nanosensors and smart networks falls precipitously. In many developing countries, this leads to a proliferation of new and useful services, including “sousveillance” mechanisms that improve governance and enable more efficient use of government resources. Intelligent electricity, water distribution, and transportation systems develop in urban areas. In these “smart cities,” Internet access is seen as a basic right by the late 2010s. A malaria vaccine is developed and deployed broadly - saving millions of lives in the developing world. Advances in low-cost mind-controlled prosthetics aid the 80 percent of global amputees who live in developing countries. Solar power is made vastly more efficient through advances in materials, including polymers and nanoparticles. An effective combination of government subsidies and microfinance means solar is used for everything from desalination for agriculture to wi-fi networks. Flexible and rapid mobile payment systems drive dynamic economic growth in the developing world, while the developed world is hampered by entrenched banking interests and regulation. Standing next to his desk at the World Meat Science Lab in Zurich, Alec took another bite of the steak that his lab assistants had just presented to him and chewed it rather thoughtfully. This wasn’t just any steak. It was research. Alec and his research team had been working for months to fabricate a new meat product - one that tasted just like beef yet actually contained only 50 percent meat; the remaining half was a combination of synthetic meat, fortified grains, and nano-flavoring. Finding the “right” formula for that combo had kept the lab’s employees working around the clock in recent weeks. And judging from the look on Alec’s face, their work wasn’t over. As Alec watched his team scramble back to their lab benches, he felt confident that it wouldn’t be long before they would announce the invention of an exciting new meat product that would be served at dinner tables everywhere. And, in truth, Alec’s confidence was very well founded. For one, he had the world’s best and brightest minds in food science from all over the world working together right here in his lab. He also had access to seemingly infinite amounts of data and information on everything from global taste preferences to meat distribution patterns - and just a few touches on his lab’s research screens (so much easier than the clunky computers and keyboards of the old days) gave him instant access to every piece of research ever done in meat science or related fields from the 1800s up through the present (literally the present - access to posted scientific research was nearly instantaneous, delayed by a mere 1.3 seconds). Alec also had strong motivation. There was no doubt that meat science - indeed, all science - was much more exciting, challenging, and rewarding in 2023 than it was a few decades ago. The shift from “lone wolf” science to globally coordinated and open-platform research had greatly accelerated the speed and spread of breakthrough ideas and developments in all fields. As a result, scientists were making real progress in addressing planet-wide problems that had previously seemed so intractable: people were no longer dying as frequently from preventable diseases, for example, and alternative fuels were now mainstream. But other trends were troubling - especially to a scientist who had spent his whole career researching food. In cities and villages around the world where children used to be hungry, access to higher-calorie meals had produced alarming increases in the incidence of obesity and diabetes. The demand for meat, in particular, was rising, but adding more animals to the planet created its own set of problems, such as more methane and spiking water demand. And that’s where Alec saw both need and opportunity: why not make the planet’s meat supply go further by creating a healthier alternative that contained less real meat? “Alec, we have a new version for you to try,” yelled Kofi from across the lab. That was fast, thought Alec, as he searched around his desk for the fork. Devastating shocks like September 11, the Southeast Asian tsunami of 2004, and the 2010 Haiti earthquake had certainly primed the world for sudden disasters. But no one was prepared for a world in which large-scale catastrophes would occur with such breathtaking frequency. the 2012 Olympic bombing, which killed 13,000, was followed closely by an earthquake in Indonesia killing 40,000, a tsunami that almost wiped out Nicaragua, and the onset of the West China Famine, caused by a once-in-a-millennium drought linked to climate change. Not surprisingly, this opening series of deadly asynchronous catastrophes (there were more) put enormous pressure on an already overstressed global economy that had entered the decade still in recession. Massive humanitarian relief efforts cost vast sums of money, but the primary sources - from aid agencies to developed-world governments - had run out of funds to offer. Most nation-states could no longer afford their locked-in costs, let alone respond to increased citizen demands for more security, more healthcare coverage, more social programs and services, and more infrastructure repair. These dire circumstances forced tough tradeoffs. In 2015, the U.S. reallocated a large share of its defense spending to domestic concerns, pulling out of Afghanistan - where the resurgent Taliban seized power once again. In Europe, Asia, South America, and Africa, more and more nation-states lost control of their public finances, along with the capacity to help their citizens and retain stability and order. Resource scarcities and trade disputes, together with severe economic and climate stresses, pushed many alliances and partnerships to the breaking point; they also sparked proxy wars and low-level conflict in resource-rich parts of the developing world. Nations raised trade barriers in order to protect their domestic sectors against imports and - in the face of global food and resource shortages - to reduce exports of agricultural produce and other commodities. By 2016, the global coordination and interconnectedness that had marked the post-Berlin Wall world was tenuous at best. With government power weakened, order rapidly disintegrating, and safety nets evaporating, violence and crime grew more rampant. Meanwhile, overtaxed militaries and police forces could do little to stop growing communities of criminals and terrorists from gaining power. Technology-enabled gangs and networked criminal enterprises exploited both the weakness of states and the desperation of individuals. With increasing ease, these “global guerillas” moved illicit products through underground channels from poor producer countries to markets in the developed world. Using retired 727s and other rogue aircraft, they crisscrossed the Atlantic, from South America to Africa, transporting cocaine, weapons, and operatives. Drug and gun money became a common recruiting tool for the desperately poor. Criminal networks also grew highly skilled at counterfeiting licit goods through reverse engineering. Many of these “rip-offs” and copycats were of poor quality or downright dangerous. In the context of weak health systems, corruption, and inattention to standards - either within countries or from global bodies like the World Health Organization - tainted vaccines entered the public health systems of several African countries. In 2021, 600 children in Cote d’Ivoire died from a bogus Hepatitis B vaccine, which paled in comparison to the scandal sparked by mass deaths from a tainted anti-malarial drug years later. The deaths and resulting scandals sharply affected public confidence in vaccine delivery; parents not just in Africa but elsewhere began to avoid vaccinating their children, and it wasn’t long before infant and child mortality rates rose to levels not seen since the 1970s. Technology hackers were also hard at work. Internet scams and pyramid schemes plagued inboxes. Meanwhile, more sophisticated hackers attempted to take down corporations, government systems, and banks via phishing scams and database information heists, and their many successes generated billions of dollars in losses. Desperate to protect themselves and their intellectual property, the few multinationals still thriving enacted strong, increasingly complex defensive measures. Patent applications skyrocketed and patent thickets proliferated, as companies fought to claim and control even the tiniest innovations. Security measures and screenings tightened. This “wild west” environment had a profound impact on innovation. The threat of being hacked and the presence of so many thefts and fakes lowered the incentives to create “me first” rather than “me too” technologies. And so many patent thickets made the cross-pollination of ideas and research difficult at best. Blockbuster pharmaceuticals quickly became artifacts of the past, replaced by increased production of generics. Breakthrough innovations still happened in various industries, but they were focused more on technologies that could not be easily replicated or re-engineered. And once created, they were vigorously guarded by their inventors - or even by their nations. In 2022, a biofuel breakthrough in Brazil was protected as a national treasure and used as a bargaining chip in trade with other countries. BUT THAT’S NOT THE ONLY POSSIBILITY. TECHNOLOGY IS GOING TO MAKE THIS EVEN MORE REAL FOR AFRICA. THERE IS THE SAME CELLPHONE PENETRATION RATE IN SOMALIA AS IN RWANDA. Verifying the authenticity of anything was increasingly difficult. The heroic efforts of several companies and NGOs to create recognized seals of safety and approval proved ineffective when even those seals were hacked. The positive effects of the mobile and Internet revolutions were tempered by their increasing fragility as scamming and viruses proliferated, preventing these networks from achieving the reliability required to become the backbone of developing economies - or a source of trustworthy information for anybody. Interestingly, not all of the “hacking” was bad. Genetically modified crops (GMOs) and do-it-yourself (DIY) biotech became backyard and garage activities, producing important advances. In 2017, a network of renegade African scientists who had returned to their home countries after working in Western multinationals unveiled the first of a range of new GMOs that boosted agricultural productivity on the continent. But despite such efforts, the global have/have-not gap grew wider than ever. The very rich still had the financial means to protect themselves; gated communities sprung up from New York to Lagos, providing safe havens surrounded by slums. In 2025, it was de rigueur to build not a house but a high-walled fortress, guarded by armed personnel. The wealthy also capitalized on the loose regulatory environment to experiment with advanced medical treatments and other under-the-radar activities. Those who couldn’t buy their way out of chaos - which was most people - retreated to whatever “safety” they could find. With opportunity frozen and global mobility at a near standstill - no place wanted more people, especially more poor people - it was often a retreat to the familiar: family ties, religious beliefs, or even national allegiance. Trust was afforded to those who guaranteed safety and survival - whether it was a warlord, an evangelical preacher, or a mother. In some places, the collapse of state capacity led to a resurgence of feudalism. In other areas, people managed to create more resilient communities operating as isolated micro versions of formerly large-scale systems. The weakening of national governments also enabled grassroots movements to form and grow, creating rays of hope amid the bleakness. By 2030, the distinction between “developed” and “developing” nations no longer seemed particularly descriptive or relevant. Philanthropy is less about affecting change than about promoting stability and addressing basic survival needs. Philanthropic organizations move to support urgent humanitarian efforts at the grassroots level, doing “guerrilla philanthropy” by identifying the “hackers” and innovators who are catalysts of change in local settings. Yet identifying pro-social entrepreneurs is a challenge, because verification is difficult amid so much scamming and deception. The operational model in this world is a “fortress model” in which philanthropic organizations coalesce into a strong, single unit to combat fraud and lack of trust. Philanthropies’ biggest assets are their reputation, brand, and legal/financial capacity to ward off threats and attempts at destabilization. They also pursue a less global approach, retreating to doing work in their home countries or a few countries that they know well and perceive as being safe. Mounting obstacles to market access and to knowledge creation and sharing slow the pace of technological innovation. Creative repurposing of existing technologies - for good and bad - is widespread, as counterfeiting and IP theft lower incentives for original innovation. In a world of trade disputes and resource scarcities, much effort focuses on finding replacements for what is no longer available. Pervasive insecurity means that tools of aggression and protection - virtual as well as corporeal - are in high demand, as are technologies that will allow hedonistic escapes from the stresses of life. Echoing the rise of synthetic chemicals in the nineteenth century, synthetic biology, often state-funded, is used to “grow” resources and foodstuffs that have become scarce. New threats like weaponized biological pathogens and destructive botnets dominate public attention, but enduring technologies, like the AK-47, also remain weapons of choice for global guerrillas. The Internet is overrun with spam and security threats and becomes strongly associated with illicit activity - especially on “dark webs” where no government can monitor, identify, or restrict activities. Identity-verification technologies become a staple of daily life, with some hitches - a database of retina recordings stolen by hackers in 2017 is used to create numerous false identities still “at large” in the mid-2020s. With the cost of cosmetic surgery dropping, procedures like the lunchtime facelift become routine among emerging middle classes. Trent never thought that his past experience as a government intelligence officer would convert into something… philanthropic. But in a world full of deceit and scamming, his skills at discerning fact from fiction and developing quick yet deep local knowledge were highly prized. For three months now he had been working for a development organization, hired to find out what was happening in the “grey” areas in Botswana - a country that was once praised for its good governance but whose laws and institutions had begun to falter in the last few years, with corruption on the rise. His instructions were simple: focus not on the dysfunctional (which, Trent could see, was everywhere) but rather look through the chaos to see what was actually working. Find local innovations and practices that were smart and good and might be adopted or implemented elsewhere. “Guerrilla philanthropy” was what they called it, a turn of phrase that he liked quite a bit. His trip into Botswana had been eventful - to put it mildly. On-time flights were rare these days, and the plane got diverted three times because of landing authorization snafus. At the Gaborone airport, it took Trent six hours to clear customs and immigration. The airport was bereft of personnel, and those on duty took their time scrutinizing and re-scrutinizing his visa. Botswana had none of the high-tech biometric scanning checkpoints - technology that could literally see right through you - that most developed nations had in abundance in their airports, along their borders, and in government buildings. Once out of the airport Trent was shocked by how many guns he saw - not just slung on the shoulders of police, but carried by regular people. He even saw a mother with a baby in one arm and an AK-47 in the other. This wasn’t the Botswana he remembered way back when he was stationed here 20 years ago as an embassy employee. The organization that hired him was probably more right than it realized in calling it guerrilla philanthropy. After many weeks spent chasing down leads in Gaborone, then an unfortunate stint that had him hiking for miles alone through the Kalahari Desert, Trent found himself traveling deep into the Chobe Forest (a nice reprieve, he thought, from inhaling all that sand). One of his informants had told him about a group of smart youngsters who had set up their own biotechnology lab on the banks of the Chobe River, which ran along the forest’s northern boundary. He’d been outfitted with ample funds for grant-making, not the forest bribes he had heard so much about; regardless of what was taking place in the world around him, he was under strict orders to behave ethically. Trent was also careful to cover his tracks to avoid being kidnapped by international crime syndicates - including the Russian mafia and the Chinese triads - that had become very active and influential in Botswana. But he’d made it through, finally, to the lab, which he later learned was under the protection of the local gun lord. As expected, counterfeit vaccines were being manufactured. But so were GMO seeds. And synthetic proteins. And a host of other innovations that the people who hired him would love to know about. The global recession that started in 2008 did not trail off in 2010 but dragged onward. Vigorous attempts to jumpstart markets and economies didn’t work, or at least not fast enough to reverse the steady downward pull. The combined private and public debt burden hanging over the developed world continued to depress economic activity, both there and in developing countries with economies dependent on exporting to (formerly) rich markets. Without the ability to boost economic activity, many countries saw their debts deepen and civil unrest and crime rates climb. The United States, too, lost much of its presence and credibility on the international stage due to deepening debt, debilitated markets, and a distracted government. This, in turn, led to the fracturing or decoupling of many international collaborations started by or reliant on the U.S.’s continued strength. Also in trouble was China, where social stability grew more precarious. Depressed economic activity, combined with the ecological consequences of China’s rapid growth, started to take their toll, causing the shaky balance that had held since 1989 to finally break down. With their focus trained on managing the serious political and economic instability at home, the Chinese sharply curtailed their investments in Africa and other parts of the developing world. Indeed, nearly all foreign investment in Africa - as well as formal, institutional flows of aid and other support for the poorest countries - was cut back except in the gravest humanitarian emergencies. Overall, economic stability felt so shaky that the occurrence of a sudden climate shock or other disaster would likely send the world into a tailspin. Luckily, those big shocks didn’t occur, though there was a lingering concern that they could in the future. Not that anyone had time to think about the future - present challenges were too pressing. In the developed world, unemployment rates skyrocketed. So did xenophobia, as companies and industries gave the few available jobs to native-born citizens, shunning foreign-born applicants. Great numbers of immigrants who had resettled in the developed world suddenly found that the economic opportunities that had drawn them were now paltry at best. By 2018, London had been drained of immigrants, as they headed back to their home countries, taking their education and skills with them. Reverse migration left holes in the communities of departure - both socially and literally - as stores formerly owned by immigrants stood empty. And their homelands needed them. Across the developing world and especially in Africa, economic survival was now firmly in local hands. With little help or aid coming through “official” and organized channels - and in the absence of strong trade and foreign currency earnings - most people and communities had no choice but to help themselves and, increasingly, one another. Yet “survival” and “success” varied greatly by location - not just by country, but by city and by community. Communities inside failed states suffered the most, their poor growing still poorer. In many places, the failures of political leadership and the stresses of economic weakness and social conflict stifled the ability of people to rise above their dire circumstances. Not surprisingly, across much of the developing world the rural-urban divide gaped wider, as more limited availability and access to resources like IT and trade made survival and self-sufficiency much more challenging for non-urban dwellers. Communications and interactions that formerly served to bridge one family or one village or one student with their counterparts in other places - from emailing to phone calls to web postings - became less reliable. Internet access had not progressed far beyond its 2010 status, in part because the investment dollars needed to build out the necessary infrastructure simply weren’t there. When cellphone towers or fiber optic cables broke down, repairs were often delayed by months or even years. As a result, only people in certain geographies had access to the latest communication and Internet gadgets, while others became more isolated for lack of such connections. But there were silver linings. Government capacity improved in more advanced parts of the developing world where economies had already begun to generate a self-sustaining dynamic before the 2008-2010 crisis, such as Indonesia, Rwanda, Turkey, and Vietnam. Areas with good access to natural resources, diverse skill sets, and a stronger set of overlapping institutions did far better than others; so did cities and communities where large numbers of “returnees” helped drive change and improvement. Most innovation in these better-off places involved modifying existing devices and technologies to be more adaptive to a specific context. But people also found or invented new ways - technological and non-technological - to improve their capacity to survive and, in some cases, to raise their overall living standards. In Accra, a returning Ghanaian MIT professor, working with resettled pharma researchers, helped invent a cheap edible vaccine against tuberculosis that dramatically reduced childhood mortality across the continent. In Nairobi, returnees launched a local “vocational education for all” project that proved wildly successful and was soon replicated in other parts of sub-Saharan Africa. COMMUNICATION, PEER GROUPS, AND COMMUNITIES OF PRACTICE. THEY MAY NOT HAVE THE MATERIALS OR KNOW-HOW. Makeshift, “good enough” technology solutions - addressing everything from water purification and harnessing energy to improved crop yield and disease control - emerged to fill the gaps. Communities grew tighter. Micro-manufacturing, communal gardens, and patchwork energy grids were created at the local level for local purposes. Many communities took on the aura of co-ops, some even launching currencies designed to boost local trade and bring communities closer together. Nowhere was this more true than in India, where localized experiments proliferated, and succeeded or failed, with little connection to or impact on other parts of the country - or the world. These developments were encouraging, but also frustrating. In the absence of enduring trade and FDI channels, local experiments and innovations could neither scale nor boost overall growth. For those looking, it was difficult to find or access creative solutions. Scaling was further inhibited by the lack of compatible technology standards, making innovations difficult to replicate. Apps developed in rural China simply didn’t work in urban India. High-speed Internet access - which gradually emerged in some areas despite weak government or philanthropic support - did help, enabling students in isolated pockets in the developing world to access knowledge and instruction through the written word and other media like video. But the development of tangible devices, products, and innovations continued to lag in places where local manufacturing skills and capacities had not yet scaled. More complex engineering solutions proved even more difficult to develop and diffuse. By 2025, collaboration was finally improving, with ecosystems of research and sharing - many of them “virtual” - beginning to emerge. Yet without major progress in global economic integration and collaboration, many worried that good ideas would stay isolated, and survival and success would remain a local - not a global or national - phenomenon. Philanthropic organizations look to fund at the grassroots level, in order to reach people more quickly and solve short-term problems. to identify and build capacity from the individual through the institutional, because without global coordination, innovation cannot scale on its own. Philanthropy requires a keen screening capacity to identify highly localized solutions, with specialized pockets of expertise that make partnerships more challenging and transitions between sectors and issues harder to achieve. Philanthropy operations are decentralized; headquarters are less important, and the ability to quickly access different parts of the world and reconfigure teams on short notice is key. Office space is rented by the day or week, not the month or year, because more people are in the field - testing, evaluating, and reporting on myriad pilot projects. Economic and political instability fracture societies in the developed world, resources for technology development diminish, and talented immigrants are forced to return to their countries of origin. As a result, capacity and knowledge are distributed more widely, allowing many small pockets of do-it-yourself innovation to emerge. Low-tech, “good enough” solutions abound, cobbled together with whatever materials and designs can be found. However, the transfer of cutting-edge technology through foreign direct investment is rare. Structural deficiencies in the broader innovation ecosystem - in accessing capital, markets, and a stable Internet - and in the proliferation of local standards limit wider growth and development. Energy technology improvements are geared more toward efficiency - getting more from existing sources of power - than new-generation technologies, though some local improvements in generating and distributing wind and geothermal energy do occur. Breakdowns in the global medicine supply chain accelerate the emergence of locally bioengineered super-strength homeopathic remedies, which replace antibiotics in the dispensaries of many developing-world hospitals. Widespread micro-manufacturing, using 3D printers, enables the fabrication of replacement components for engines and machines, allowing “perpetual maintenance” to compensate for broken trade links. Garden allotments proliferate in mega-cities as new urban-dwellers seek to supplement a scarce food supply and maintain their agricultural heritage. Technically advanced communities use mesh networks to ensure high-speed Internet access, but most rural poor remain cut off from access. The beat-up six-seater plane in which Lidi was the lone passenger lurched suddenly. She groaned, grabbed the armrests, and held on as the plane dipped sharply before finally settling into a smooth flight path. Lidi hated small planes. But with very few commercial jets crisscrossing Africa these days, she didn’t have much choice. Lidi - an Eritrean by birth - was a social entrepreneur on a mission that she deemed critical to the future of her home continent, and enduring these plane flights was an unfortunate but necessary sacrifice. Working together with a small team of technologists, Lidi’s goal was to help the good ideas and innovations that were emerging across Africa to spread faster - or, really, spread at all. In this, Lidi had her work cut out for her. Accelerating and scaling the impact of local solutions developed for very local markets was far from easy - especially given the patchiness of Internet access across Africa and the myopic perspective that was now, in 2025, a widespread phenomenon. She used to worry about how to scale good ideas from continent to continent; these days she’d consider it a great success to extend them 20 miles. And the creative redundancy was shocking! Just last week, in Mali, Lidi had spent time with a farmer whose co-op was developing a drought-resistant cassava. They were extremely proud of their efforts, and for good reason. Lidi didn’t have the heart to tell them that, while their work was indeed brilliant, it had already been done. Several times, in several different places. During her many flights, Lidi had spent hours looking out the window, gazing down on the villages and cities below. She wished there were an easier way to let the innovators in those places know that they might not be inventing, but rather independently reinventing, tools, goods, processes, and practices that were already in use. What Africa lacked wasn’t great ideas and talent: both were abundant. The missing piece was finding a way to connect those dots. And that’s why she was back on this rickety plane again and heading to Tunisia. She and her team were now concentrating on promoting mesh networks across Africa, so that places lacking Internet access could share nodes, get connected, and maybe even share and scale their best innovations. As you have seen, each of the scenarios, if it were to unfold, would call for different strategies and have different implications for how a range of organizations will work and relate to changes in technology. But no matter what world might emerge, there are real choices to be made about what areas and goals to address and how to drive success toward particular objectives. We hope that reading the scenario narratives and their accompanying stories about philanthropy, technology, and people has sparked your imagination, provoking new thinking about these emergent themes and their possibilities. Three key insights stood out to us as we developed these scenarios. First, the link between technology and governance is critical to consider in better understanding how technology could be developed and deployed. In some futures, the primacy of the nation-state as a unit of analysis in development was questioned as both supra- or sub-national structures proved more salient to the achievement of development goals. In other futures, the nation-state’s power strengthened and it became an even more powerful actor both to the benefit and to the detriment of the development process, depending on the quality of governance. Technologies will affect governance, and governance in turn will play a major role in determining what technologies are developed and who those technologies are intended, and able, to benefit. A second recurring theme in the scenarios is that development work will require different levels of intervention, possibly simultaneously. In some scenarios, philanthropic organizations and other actors in development face a set of obstacles in working with large institutions, but may face a yet-unfolding set of opportunities to work with nontraditional partners - even individuals. The organization that is able to navigate between these levels and actors may be best positioned to drive success. ON A THREE, FIVE, OR SEVEN YEAR CYCLE. WHAT SCALE IS REQUIRED FOR DEPLOYMENT TO BE SUCCESSFUL? WHAT LEVEL OF EDUCATION IS NEEDED TO BE SUSTAINABLE IN TERMS OF MAINTENANCE? HOW DO THESE REQUIREMENTS EVOLVE OVER TIME? The third theme highlights the potential value of scenarios as one critical element of strategy development. These narratives have served to kick-start the idea generation process, build the future-oriented mindset of participants, and provide a guide for ongoing trend monitoring and horizon scanning activities. They also offer a useful framework that can help in tracking and making sense of early indicators and milestones that might signal the way in which the world is actually transforming. While these four scenarios vary significantly from one another, one theme is common to them all: new innovations and uses of technology will be an active and integral part of the international development story going forward. The changing nature of technologies could shape the characteristics of development and the kinds of development aid that are in demand. In a future in which technologies are effectively adopted and adapted by poor people on a broad scale, expectations about the provision of services could fundamentally shift. Developing a deeper understanding of the ways in which technology can impact development will better prepare everyone for the future, and help all of us drive it in new and positive directions. The following is a list of the 15 critical uncertainties presented to participants during this project’s primary scenario creation workshop. These uncertainties were themselves selected from a significantly longer list generated during earlier phases of research and extensive interviewing. The uncertainties fall into three categories: technological, social and environmental, and economic and political. Each uncertainty is presented along with two polar endpoints, both representing a very different direction in which that uncertainty might develop. This report is the result of extensive effort and collaboration among Rockefeller Foundation initiative staff, Foundation grantees, and external experts. The Rockefeller Foundation and GBN would like to extend special thanks to all of the individuals who contributed their thoughtfulness and expertise throughout the scenario process. Their enthusiastic participation in interviews, workshops, and the ongoing iteration of the scenarios made this co-creative process more stimulating and engaging that it could ever have been otherwise. Thank you as well to all Foundation staff who participated in the scenario creation workshop in December. A special thank you also to Laura Yousef.